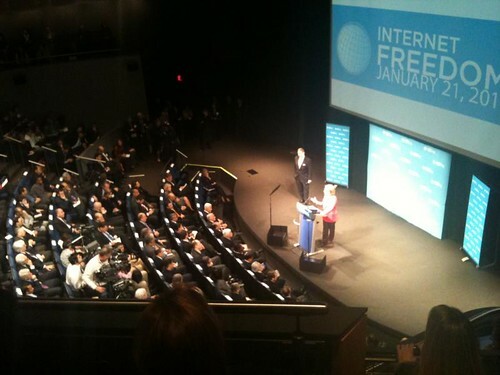 On January 21, 2010, Secretary of State Hillary Rodham Clinton gratified a legion of us geeks by giving a rousing speech announcing the United States’ new policy on, “Internet Freedom.” The term Internet Freedom, unfortunately, oversimplifies and amalgamates complex international issues such as ‘Access to Information,’ ‘Intellectual Property,’ and ‘Internet Regulation,’ under a single, amorphous banner. This may have been necessary to inclusively address these issues in Secretary Clinton’s speech, but by lumping these together, without preemptively establishing a refined definition, cohesive implementation plan, or coalition of supportive constituencies, we’ve endangered the common enterprise of defining normative behavior among civilized people. Secretary Clinton’s speech, delivered without the explicit or implied support of partner states, unilaterally framed access to the Internet as a basic human right, provided for under a penumbra of principles embodied in the Universal Declaration of Human Rights. As with many discussions about affirmatively stated human rights, however, the interpretation of those principles varies widely. As Rebecca MacKinnon explained in a recent Guardian article, the US’s traditional human rights allies, such as France, Italy, and the UK have different approaches to foundational component issues of Internet Freedom, such as intermediary liability. While the United States ought to be commended for taking a boldly principled stance on access to information, it is difficult to underestimate the value of multilateralism on issues so global in scope. Perhaps as concerning, by identifying the growing host of countries that constitute our greatest counter-polarities, we have created a de facto coalition aligned against the American conception of Internet Freedom. As important as it is to engage states like China, Cuba, Iran, and Burma, there are many more states that practice middling forms of information restriction, such as soft censorship. It is in places like Poland that important victories are quietly being won, incrementally demonstrating how to move toward free access to information. Conversely, Venezuela’s Hugo Chavez, who had remained comparatively (and uncharacteristically) quiet on access to information issues, has started saber rattling about the need for increased Internet regulation. In these middle ground countries, the United States’ evangelical branding has the potential to limit the availability of moderate or politically convenient progress. Leading the charge for Internet Freedom by example, focusing on the digital chapter of the Anti-Counterfeiting Trade Agreement (European Digital Rights answers FAQ here), the controversy over NSA’s Policy for Surveillance Programs, intermediary liability, and other flashpoint issues. Engaging the business community through corporate social responsibility avenues, such as the Global Network Initiative, in order to prevent the spread of technologies and services with potentially negative applications. Leveraging diplomatic channels to build international support for the definition and enforcement of Internet Freedom principles, using common points of disagreement to frame the debate. Providing education and technological support to civil society organizations in contravention of oppressive regimes. The common thread through these four priorities was a growing unease about the ability of the United States to embody Internet Freedom or rally enough support to leverage it over others. There is no need to panic, the United Kingdom, and much of Europe, will likely join us in similarly conceived leadership- if not on regulatory policy, than at least in resisting repressive regimes. Europe’s robust support, however, would have been more apparent, were they on-hand to participate in the announcement of this policy. In the meantime, promoting circumvention technologies to civil society in repressive regimes is absolutely necessary, but it is only an interim solution. As has been said by others, the escalation of censorship and circumvention technologies is rapidly becoming the arms race of this era. This arms race, however, is arguably the most multi-lateral in history, involving sovereigns, private interests, and the crowd. Nevertheless, as Assistant Secretary of State Posner recently testified before the Senate and Representative David Wu demonstrated by introducing the Information Freedom Act of 2010 to the House, it is an arms race in which the United States is rightfully determined to run. Circumvention technologies, however, will not effectuate the social, political, or economic changes envisioned by the United States. If we are to truly progress toward a global Internet culture, we will need to multilaterally address each component issue individually and lean less on words like freedom, altogether.